December 12 officially marked the first day of Hanukkah. It also marks the start of some tasty festive food. Here’s a list of the traditional food served during this Jewish festival. This food has very special meaning to Jewish people because of the story of the Maccabees. When the Jews managed to reclaim the Temple in Jerusalem, they had very little oil, only enough to sustain them for one day. Miraculously though it managed to stay alight for eight days. Hence this festival is also knows as the “Festival of Lights”. To celebrate this special occasion, Jews eat a lot of fried food during Hanukkah. Latkes is a fried potato pancake that is most popular. Some like it sweet while others like it savoury. 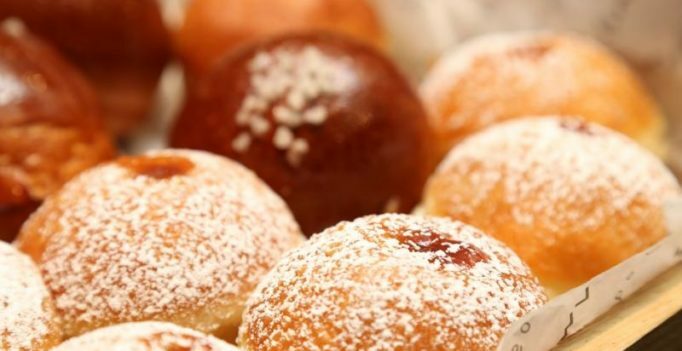 Sufganiyot are deep-fried doughnuts with a strawberry jam filling. Chocolate coins are wrapped in silver or gold foil and given out at Hanukkah. “The custom had its origin in the 17th-century practice of Polish Jewry to give money to their small children for distribution to their teachers,” Rabbi A. P. Bloch explained in a report by The Independent. This is a popular dish for many Jewish festivals. Initially it was popular because the cost of brisket was low and many Jews living in eastern Europe were poverty-stricken.